I received my early Christmas gift today, everyone. This morning I was contacted that I won the Legends of Europe 2013 Market Basket Contest with this recipe. My category was Prosciutto di San Daniele and I submitted two dishes in September. 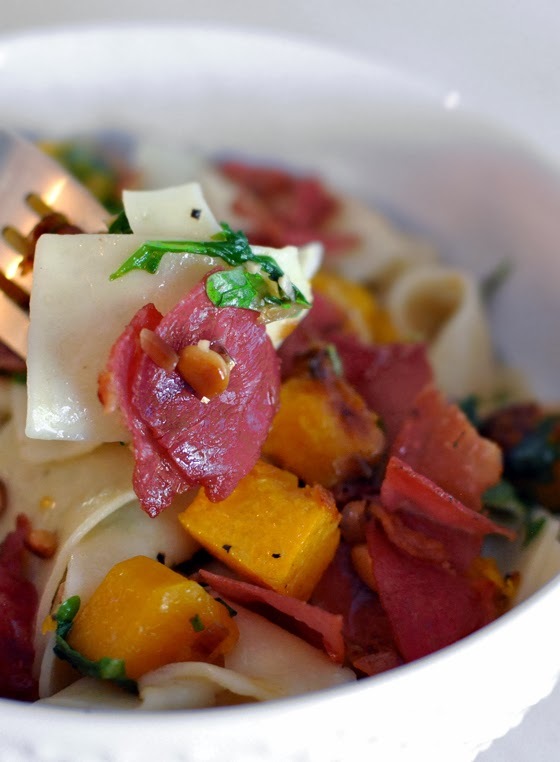 First one was Prosciutto Wrapped Lobster Tail over Creamy Fennel Risotto, and the second one this Prosciutto and Butternut Squash Pasta. I like both dishes, but I have to admit that I liked the pasta dish better. I guess they did, too. I am so excited, it feels amazing to be recognized. Thank you so much! 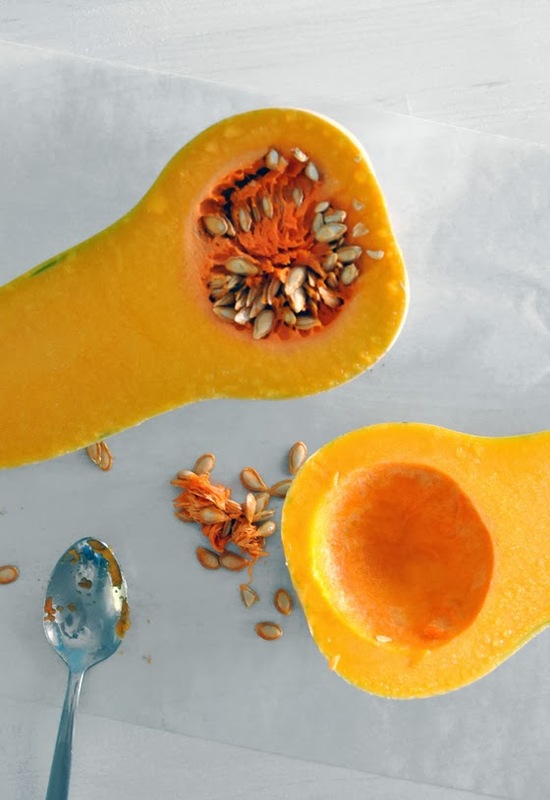 Preheat the oven to 400 F. Begin the dish by preparing the butternut squash for roasting. Cut a very thin piece of the bottom to make it more stable, and then cut it in half lengthwise. Use a vegetable peeler to remove the skin. With a large spoon scoop the membranes and seeds from the center. Cut it into 1/2" cubes. 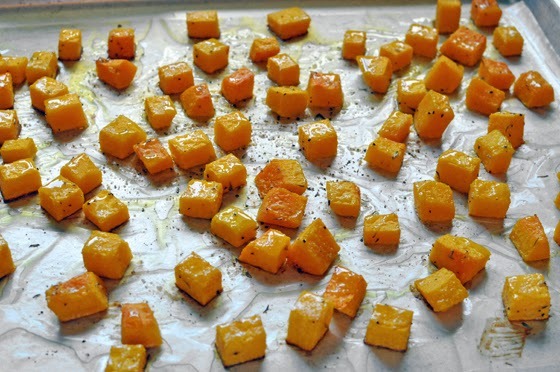 Now, season the squash with a tablespoon of olive oil, one clove of minced garlic, some fresh thyme (1 sprig) and salt and pepper. Toss it all together so everything is coated and then put on a cookie sheet lined with greased baking paper. Roast for about 25 minutes. 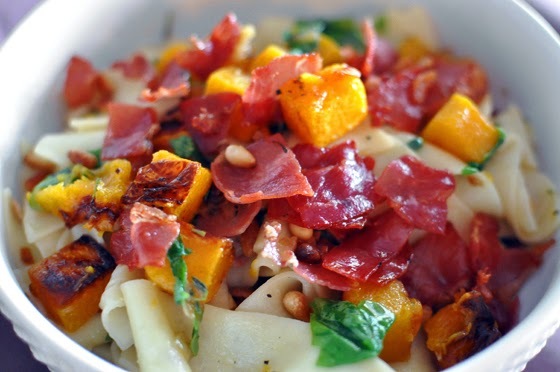 While the squash is roasting, begin preparing the rest of the dish. Start boiling the water for pasta in a large pot, you will season the water when it starts boiling with a lot of salt. Like three tablespoons. If you season the water as soon as you get it on the stove, it will take longer for it to start boiling. Thinly slice one clove of garlic and chop the herbs very finely. Slice the Prosciutto lengthwise and then into one inch pieces. Heat the remaining three tablespoons of olive oil in a large pan and saute the shallots for a few minutes, until they become translucent. Add one thinly sliced clove of garlic and herbs to the pan and as soon as you can smell the garlic, add sliced Prosciutto di San Daniele. Cook it for about two minutes. 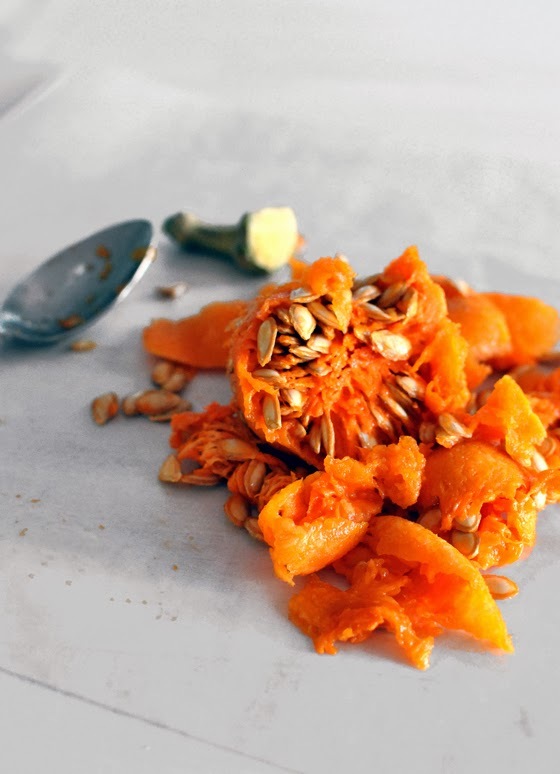 Add roasted Squash to the pan (about two cups of it) and half of the toasted pine nuts. 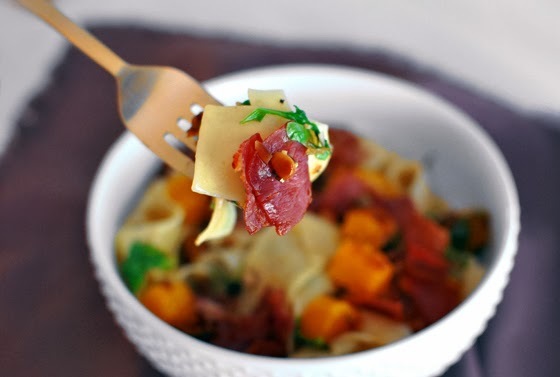 Season with salt and pepper, but be careful with the salt, Prosciutto will already give it lots of saltines and flavor! Boil the pasta al dente, according to your package, and then add it to the pan. Immediately put the arugula in and toss everything together. Check for seasoning once again and then serve. 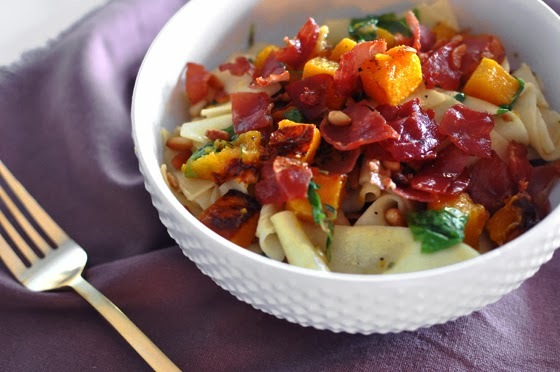 Top each serving or the dish you are serving it in with remaining toasted pine nuts and enjoy! If you want, you can also add some thinly shaved Parmesan cheese on top, but believe it or not, I didn't think it needed any, no matter how much I love cheese (especially a good Parmesan). But if you are a fan, it would certainly go beautiful together. ja bih to jela. sad! ovog trena!